Even though I’ve been on a health kick lately, that’s no reason to sacrifice taste. All it means is that I need to get more creative with the ingredients I’m using in the kitchen and turn to other countries for some spice inspiration. My next dish is a new twist on the classic Moroccan tagine dishes cooked in earthenware pots and full of delicious spices and curries. But don’t fear if you don’t have an actual tagine – my recipe makes good use of a crock pot instead. I’ll be honest, the healthy eating is good, but the lack of flavor of chicken breast after a while was getting to me. I needed to spice it up without heavy sauces or oil, so I decided to start looking for inspiration outside of the US. Someone’s gotta be adding flavor without cheese or cream, right? Right! India, North Africa and the like have been doing it for centuries it turns out. 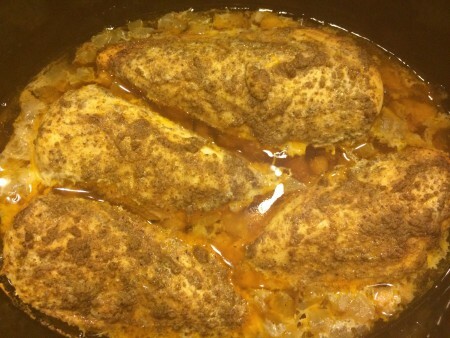 Curry powder, chile powder and other strong spices used liberally make fish, chicken and beef much more palatable. Eureka! 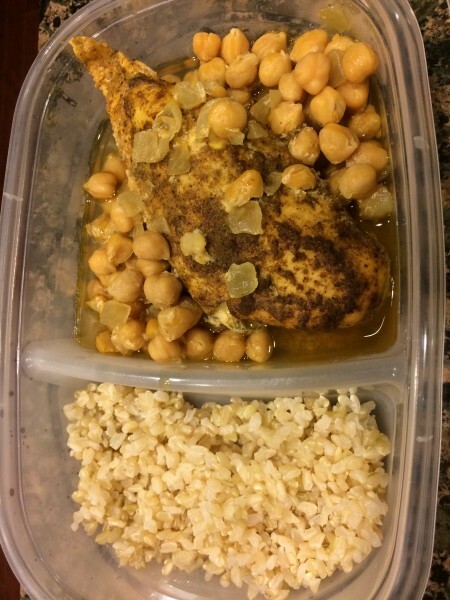 While I didn’t have a traditional clay pot to cook my chicken in over hot coals, I do have a slow cooker that can do relatively the same kind of job, so I set to work adapting a recipe of chicken and chickpeas into a very tasty dish. Combine oil, curry powder, garlic powder, paprika, pepper and salt in a small bowl so they form a paste. Rub the mixture over the chicken breasts, making sure to coat them on both sides. Finely chop the onion and drain and rinse the chickpeas with a colander in the sink (this helps eliminate more sodium from them). Pour the onion, chickpeas, 1/2 c. water and the chicken broth in a 5 – to 7-quart slow cooker. 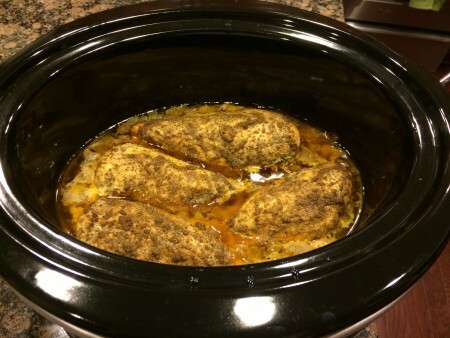 Place the chicken breasts on top, cover the slow cooker and cook on low for 6 hours. When the chicken is done, prepare the rice according to package directions and divide evenly among bowls, then spoon chicken, chickpeas and broth over the top. Top with chopped cilantro, if desired and serve. The moisture from the crock pot made my lens fog up a bit. This is ready for me to take to work tomorrow. Looks yummy!